On Monday, Honda announced that the 2014 Honda Accord Plug-in, the most fuel efficient sedan in America, is now on sale in selected dealerships in New York and California. The Accord Plug-in is Honda's first plug-in hybrid vehicle, though not its first plug-in electric vehicle, and was the first production car to meet California's new more stringent LEV3/SULEV20 emissions standard. It will also qualify for California's green single-occupancy HOV access sticker. 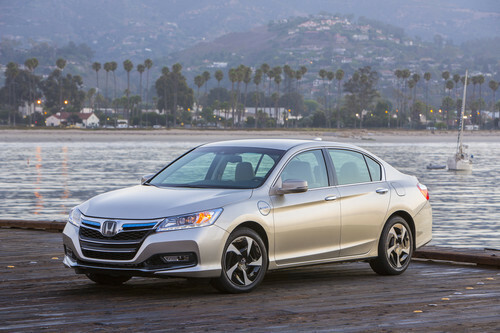 The Honda Accord Plug-in is a plug-in hybrid version of the popular Honda Accord. There is a small bit of irony to Honda having made the Accord their first plug-in hybrid vehicle. Back, 13 years ago, during California's EV Mandate era, Honda built and leased the EV+ electric car, marketing it with advertising that read "A Car with a Cord, Sounds like a Honda." And, here we are with Honda selling a Honda Accord that has a Cord. This car has a 6.7 kilowatt-hour lithium-ion battery pack that provides a 13 mile electric only driving range. This electric range is quite a bit less than other plug-in hybrids like the Ford Energi plug-in hybrids, or Chevy Volt, but it is in line with the Toyota Prius Plug-in. The all-new Honda Earth Dreams drive train is a two-motor system, that consists of a 124-kilowatt (kW) electric motor that also acts like a continuously variable transmission (e-CVT) mated to a fuel-efficient 2.0-liter i-VTEC, Atkinson cycle 4-cylinder engine. The drive train allows for seamless transitions between all-electric drive, blended gasoline-electric Hybrid Drive; and direct Engine Drive. Driving mode is also selectable via a button on the dashboard. By default the Accord Plug-in starts up in EV mode, and will drive on electricity until the pack is depleted at which time the engine is started to recharge the pack. The engine also kicks in during heavy acceleration or high speed to provide extra power. A button on the dashboard lets the driver select EV mode to manually force the Accord Plug-in to prefer electric driving. In another mode, "HV", the Accord plug-in acts as a conventional hybrid blending gasoline engine and electric drive, but at a higher fuel efficiency than one gets with conventional hybrids. Because of the small battery pack, a complete recharge of the Accord Plug-in from a 120 volt outlet takes less than three hours. Via a 240 volt charging station a complete recharge takes about an hour. Both of these recharge times are much shorter than most other electric cars, but that is due to the small battery pack. The small battery pack, and consequent short electric driving range, means that most Accord Plug-in owners will be burning gasoline almost every day. That's because the average daily driving distance is 40 miles, and it would only be those with the shortest commutes who can avoid burning gasoline. On the other hand the Accord Plug-in's HV mode should give much higher fuel efficiency than conventional hybrids that cannot plug in. The Accord Plug-in is based on the design of the standard Honda Accord, but with a few unique styling cues. It went on-sale at select New York and California Honda dealers on January 15 with an MSRP of $39,780 and a monthly lease price of $429. Just to shine some light on the comparisons; the Ford Focus is actually an all electric, however this may be referring to the Ford CMAX Energi plug in hybrid or the Ford Fusion plug in hybrid. Either way the reference is correct in that all 3 Ford models have greater range than the 13 miles. I appreciate the information and will watch the plug in hybrid segment's progress with great interest. Thank you, I messed that up and I do know better having driven the Ford vehicles. Have corrected it in the article.